Abdo Misr is a geometrical style. This is an OpenType Font supporting Arabic, Persian, Urdu, abd English to and compatible with the various operation systems and modern software. The combination of modern Kufi and Geometrical styles and varying between straight and curved parts made it a beautiful typeface appropriate to the titles and slogans, and able to meet the desire of the user in the design of ads and modern designs of various types of audio and visual. Carnac, a minimalistic monoline face follows the same linear structure as its earlier released, rounded counterpart Carnas. Carnac, however, appears crisp and fresh because of its squared edges and angular contours. It is a clean, contemporary face with a wide range of styles from Thin to Black. Designed to be ideal for shorter and longer text applications and also for headlines and signage. The Carnac family consists of 16 styles and is well suited for ambitious typography. It comes in OpenType format with extended language support. All weights contain ligatures, superior characters, proportional lining figures, tabular lining figures, proportional old style figures, lining old style figures, matching currency symbols, fraction- and scientific numerals and matching arrows. 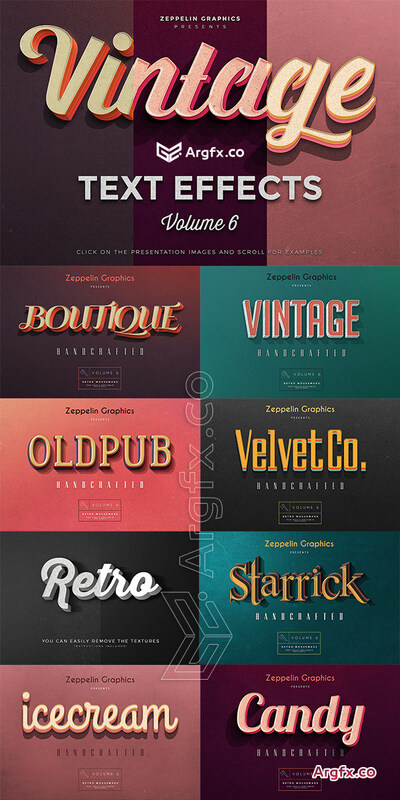 After a long break we decide to continue with our Vintage Text Effects series and we are happy to present you Volume 6! This is the best set we made so far but we will release 4 more in the near future! Very easy to use. Replace the text in seconds via smart object layers. See instructions for more info! Works with text, vector shapes or any kind of shape really. Editable text. All fonts used are free to use or free for personal use. The links for the fonts are in the Help file located in the main download. But you can use any fonts you want! We improved a lot of stuff with this new set! The presentation is a lot better and we can show you a lot more examples thanks to the fact that we can upload more than 5 images now. We included a new PDF file with a lot of useful instructions. You will also find preview images in the download and the overall look and quality of the text effects and the graphics is now better. Easily create stunning color double exposure effect in a few seconds. After action finished work, you can choose a color tone to your composition. You can use it for presenting your work, websites, blog, print projects, advertisement, social networks.